Your attention is required! 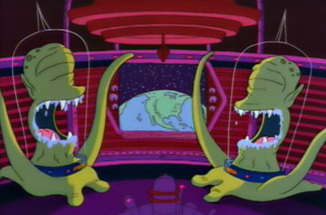 My name is Kang, and this is my sister Kodos. We have taken time out from our busy schedule of rigging the United States presidential elections to talk with you for a few minutes about movies! You do not know it, but we are in control of the world because of our cunning plan to keep you content and in air conditioned movie theaters, watching mindless drivel! Implanted in this drivel are messages that will make you soft and simple when our planet, Rigel VII comes to take over your pathetic world! Ha ha ha ha ha ha ha ha ha! August is a stupid month for movies! And we will prove it! But this is good, because you pathetic humans will only lose I.Q. points as you let your minds rot! And then, in September, the Fall TV season begins! We had big plans for this movie! Unfortunately, you humans seem to be starting to wise up to our ways! It is not acceptable to just transfer messages to your brains through any old crappy movie delivery system! When did you get so discerning!? You are still the people who make shows like So You Think You Can Dance and American Idol hits! Humans, these are mummies! You love mummies! And zombies! And vampires! But there are no zombies or vampires here. Don't let us mislead you on that front! If you will go and see the mummies we promise to show you real zombies on your world! Just don't try to pet them! We are bringing the Thunder down on you! This movie is about actors who think they are in a movie but are really in a war zone! They are just like you! You are going to your boring job every day and typing on your computer and wasting time but all around you the world is falling apart and will be an annex of Rygel VII before the year's end! Did you see the Montauk Monster? There is a reason he has shown up now! Don't believe Jeff Corwin! He is a fraud! Stoners are the easiest people to assimilate into our plan! You simply place a behavior-controlling substance into their weed of choice and they become primed and prepared for manipulation! There is a reason that paranoia sets in! Seth Rogen is one of our finest double agents and he doesn't even know it! We worry about James Franco and his plan for graduate school, though! What is wrong with you people?! What is it that makes you behave like such giant nerds when you see the words Star Wars? The Rygel VII saga is much more fascinating and there is no Jar Jar! Midi-Chlorians are not real! The force is stupid! Teeth and tentacles are the way to prevail! The portrayal of Jabba the Hut was based on stereotypes! Princess Leia in a bikini was far too ugly for him! This movie will become your reality soon enough! When we enslave you all, you will have the opportunity to earn your freedom by racing Mad Max cars but we will always have a robotic Jason Statham to defeat you! Hey, it's better than being defeated by Robotic Richard Simmons!